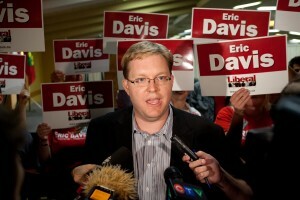 Eric Davis speaks with reporters shortly after winning the Liberal nomination. (Photo by Nick Lachance). 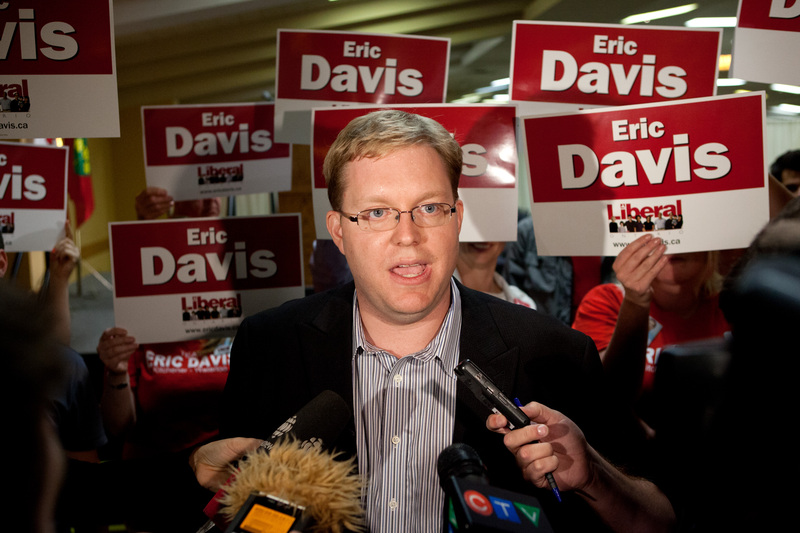 Eric Davis will get a second chance at a seat in the Ontario legislature a little sooner than most. Less than a year after placing second in the Kitchener-Waterloo riding in last October’s provincial election, Davis will once again run for the Liberals in the K-W byelection, which, as Premier Dalton McGuinty announced Wednesday, will take place Sept. 6. Davis was named the Liberal candidate late Thursday night after a marathon nomination meeting at Bingeman’s in Kitchener. In all, the meeting lasted over five hours and saw 1,027 votes cast by members of the local riding association. Davis beat out Waterloo city councillor Karen Scian and Waterloo Regional Police staff sergeant Raj Sharma for the nomination. In his speech prior to the vote, Davis took the high turnout at the Liberal meeting as an opportunity to poke some fun at his Progressive Conservative and New Democrat counterparts. Though only just over 1,000 voted, organizers estimated that there was nearly 2,000 people in attendance. While Sept. 6 will be Davis’s second time running for MPP of K-W, the political dynamics in the region today are quite different than they were in October of 2011. The K-W seat was left vacant in late-April when PC Elizabeth Witmer, the long-time MPP for the riding stepped down to take an appointed position as the chair of the Workplace Safety and Insurance Board. Witmer had been the riding’s representative in the legislature for 22 years. Davis also took a shot at the PC leader during his speech to the voters. “I don’t trust Tim Hudak to organize a deck of cards, let alone the province of Ontario,” he said. A local lawyer and Wilfrid Laurier University alumnus, Davis placed second in last October’s provincial election, losing out to Witmer by 3,519 votes. This time around, however, there’s more riding on the result in K-W. Should the Liberals claim a victory in Kitchener-Waterloo — as well as in a more-recently announced byelection in Vaughan — they would claim a de-facto majority by pulling even with their opposition in terms of number of seats. Speaker Dave Levac, who votes in the event of a tie, is a Liberal and traditionally the speaker sides with the government. However, Davis says he won’t let the potential ramifications on Queen’s Park change his campaign. For the nearly 45,000 students in the riding, the Sept. 6 election date falls in a difficult time, right in the middle of Orientation Week at both Laurier and the University of Waterloo. “I think it’s actually a pretty unique opportunity falling in Orientation Week,” added Drew Redden a Laurier grad and former president of the WLU young Liberals. With the election of Davis as the Liberal candidate, the field for the K-W byelection is now set. Tracey Weiler will run for the PCs, Catherine Fife for the NDP, Stacey Danckert for the Green party and Allan Detweiler for the Libertarian party.